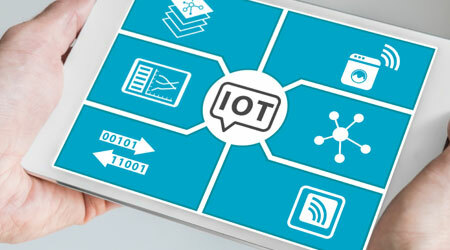 The Internet of Things (IoT) is a term that means just what its name implies: a computer-based system connecting things. These “things” can be anything. They can be a thermostat or mobile phone features in a smart home, a very expensive piece of equipment in a warehouse, or advanced medical technology. The premise is simple. When connected with IoT, “things” communicate with each other — a computer or mobile device — to trigger action or send data. Interconnected technology like this is relatively new in the cleaning industry, but it’s been generating a lot of buzz lately, especially among tech-savvy manufacturers and data-driven end users. First introduced in the U.S. in 2013, IoT technology is available for three categories of custodial operations. First, we are seeing the introduction of “smart restrooms,” where messages are sent when paper runs low and soap dispensers need filling. Second, IoT can optimize trash and recycling collection by communicating to a central database when containers need to be emptied. Third, it’s being introduced in floor equipment to save labor, time and cost, as well as optimize the customer experience. When it comes to floor equipment, IoT can be used as part of what many manufacturers call “fleet management services,” or as an integral component of automatic, hands-free, robotic floor equipment. Fleet management refers to a system of IoT-enabled floor cleaning equipment that communicates through the wireless software to track the location, usage history, maintenance schedule and battery charge of equipment within that fleet. This information is available for any custodial supervisor to more effectively manage their cleaning operations. IoT software, as part of a “fleet management” floor care equipment package, will track maintenance schedules, letting cleaning supervisors know when it is time to perform routine maintenance checks. In addition, IoT features can be used to track battery charge, sending signals when it’s time for a piece of equipment to be charged. The Global Positioning System (GPS) function included in most IoT-enabled floor equipment can come in handy for facilities with many pieces of floor equipment, especially when that floor equipment is shared among a few buildings on a sprawling campus. Lastly, IoT can track usage and productivity, sending supervisors information to help them keep tabs on their workforce, allowing managers the opportunity to better gauge their department’s equipment and labor needs.